It's the ultimate show-and-tell! 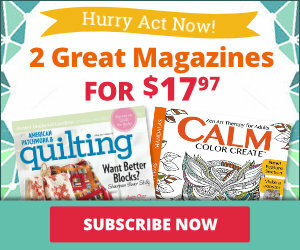 The editors of American Patchwork & Quilting, Quilts and More, and AllPeopleQuilt.com are sharing their stories in fabric. Read our stories then make a 9x12" quilt and tell us your story. 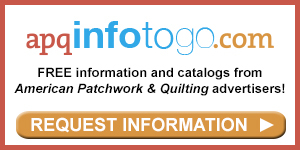 I Am a Quilter, passionate about quilting from start to finish. I LOVE FABRIC—all of it! Traditional, reproduction, bright, batik, romantic, contemporary—I often buy collections of fabric without any thought of what quilt I’m going to make from it. Each tiny envelope on my quilt represents fabrics from my stash. Some have been made into quilts, others are waiting for the perfect pattern to come along. No two envelopes are alike, representing the diversity in tone, texture, and mood of the fabrics I’ve collected. There is a hand-dyed wool envelope, too, and a few buttons tossed in to represent occasional embellishments. The tiny bundles of fabric on the lower left represent binding, which is my favorite part of the quilt-making process. When finishing a quilt top, I make the binding at the same time—rolling it and tying a ribbon of fabric around it. It is my gift to myself. The rolled binding is always stored in the same spot in my sewing room, ready and waiting. It makes me happy to see those bundles which signify that I am close to finishing another quilt. So, what about the blank spaces on my quilt? They are there to remind me that there is always room for more quilts. 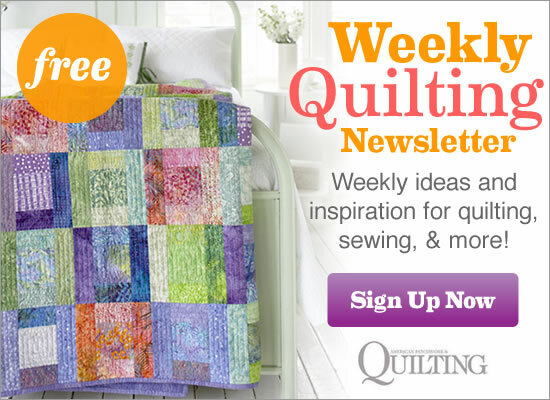 To quilt-finity and beyond! Want to see more? Visit the I am a Quilter gallery for more stories and photos. The Square-in-a-Square blocks in my story in fabric are meant to show this—starting from an intricate block in the upper left and losing rounds of pieces to end up like the solid block in the lower right. My mini quilt also reflects that I love making traditional patterns but with funky, brighter fabrics. The big-piece quilts I make are another great way to use all of those amazing fabrics I collect! I Am a Quilter and my story in fabric is just like me. I like to play with colors that make me feel good. And, I like to develop simplified designs that allow the fabrics to be the “star.” The fabrics in the strip represent important people and events in my life. A broccoli-print fabric is for my Dad who was, before his retirement, the world’s largest broccoli grower. The gingko fabric is for my husband, Steve. Always the botanist, he continually reminded me that the gingko leaf I loved for its wonderful shape came not from trees but from angiosperms...a little known fact. Kaffe Fassett prints are all from my sister’s quilt shop...Kaffe grew up in the same part of California where I did. His colors and patterns appeal to my inner soul. Some of the fabrics were hand dyed by my son, Peter, and his wife, Amber. Other batiks are from my ever-growing stash. I’ve never met a batik I didn’t like. Many of these batiks have been used in other quilts I’ve made for my grandchildren. The scraps are too precious not to save. I often use black-and-white prints to offset bright colors in both quilts and quilted clothing, and to add a little zing, thus the narrow piping of black-and-white dots, and the binding of black and white stripes. In keeping with my “make it simple” mantra, the background is cut from one stripe that complements the fabric strips. I Am a Quilter with very eclectic taste. I like reproduction fabrics and traditional patterns, but I also dye my own fabric and love to add embellishments like beads, variegated threads, and novelty yarns to my quilts. My favorite technique is foundation piecing, so I made Log Cabin blocks to represent that part of me. I hand dyed the purple and blue fabrics on the left hand side of the quilt. I carry a box around with me that holds Grandmother’s Flower Garden blocks that I have been hand-piecing for over 10 years. It’s my take-along project. The lady in the middle of this block on the quilt represents my Great Aunt Gertrude (who lived to be 104) who inspired me to quilt. I added the charms with the words “Create, Share, Inspire” because it sums up what I hope to do and show ‘n’ tell is my favorite part of any guild meeting. I am PROUD to be a Quilter! 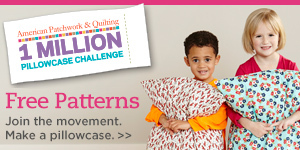 I Am a Quilter, a brand new quilter, in fact. I wanted to tell my story in fabric in a simple way to show everyone that quilting is easy and you CAN do it, even if you’re a beginner. I’ve been quilting less than a year, but it didn’t take me long to figure out what I love the most. The first place I got hooked was with the fabrics—there are so many fabulous choices. I made my own fabric for this block by strip-piecing a few of my favorite prints together, then cutting the block pieces from that pieced cloth. It was a great (and easy) way to use lots of fabrics. Choosing a design was easy, too. I decided to make my favorite block— the Churn Dash. I used fabric that looks like measuring tape for the binding, because accuracy is important to me. 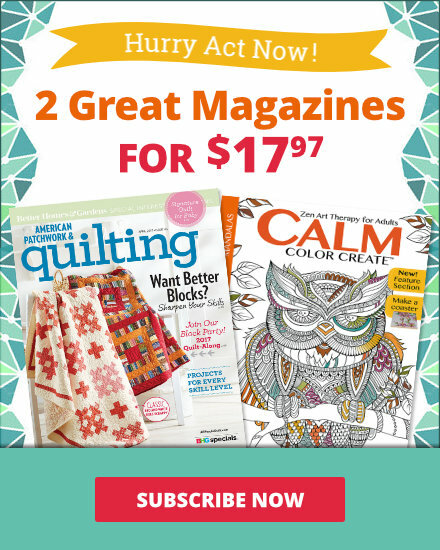 My story in fabric is bright, fun, and easy—just like quilting is for me!